Air conditioning jobs are now in great demand as HVAC equipment are continuously being installed in all buildings and majority of homes. The conditioning of air for our comfort has now become a necessity instead of luxury. The last 50 years had seen the advancement of this field in all areas from design, manufacturing, sales to servicing. The use of electronic controls have taken over most of the mechanical types of controls due to their better performance, features and availability. If you have the interest in this field and are considering of going into this field, you will be glad to know that there is a whole range of jobs that you can choose from after you graduate from your school or college. See the descriptions of some of the jobs you can be involved in below. HVAC equipment are produced in factories and personnel is required to design the equipment based on the standard required or customers' requirements. Research and development department comes up with design that is up to date, cost and functions after getting the market feedback from dealers, installers, service engineers and the customers. Design work is very technical in nature and you will be utilising what you have been taught during your training days in college. If you are into mechanical design, principles of thermodynamic, psychrometric charts, heat load calculations and duct design are some of the topics you will most probably be using. Within the same plant, you can also be involved in the purchasing of raw materials for the production of the equipment. Purchasers spend a lot of time with the suppliers to negotiate the best price for the parts as well as delivery of the goods to ensure that the production line continues to operate as schedule. Many purchasers also go to factories where the parts are produced to audit the quality of the parts based on ISO standards. They are usually accompanied by Quality Assurance Manager in the event that they need help in technical aspect of the parts that are being audited. 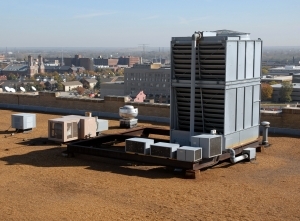 HVAC equipment at the rooftop of a building. Installers and servicing technicians will need to be here during installation or servicing. Other air conditioning jobs that you can choose to take up are sales and marketing of the products of the company. Here, you will be required to learn up the technical aspects of the products in such a way that you are able to communicate with dealers or the end customers. Fresh marketing ideas come through doing market research and the study of competitors' products. You could also join the production department as industrial engineer, production engineer or maintenance engineer. These engineers work together to ensure that the production line operates smoothly. Working in the factory means that you are under employment. However, you may choose to set up your own business venture after getting the necessary work experience. You should also be prepared to travel overseas as many manufacturing plants are set up in countries where the labor cost is low. China, India, Vietnam and the Philippines are some of the countries where manufacturers go to due to the lower labor cost and readily available market for the products. All big buildings require the service of consulting firms to design and ensure the proper installation and operations of the equipment in the buildings. You can join the firm as design engineers in preparing the drawings, costing, technical specifications, supervision of installation of HVAC equipment as well as giving the final approval to the site installers before they are allowed to go live. Draftsman, consulting engineer, project manager, inspector and technical writer are some of the air conditioning jobs that you can apply to after your graduation. Contracting firms usually take the design of the HVAC systems and implement the equipment according to the specifications provided by the customer. The fabrication of components, drawings, sourcing and purchasing of suitable equipment are done by the HVAC engineers deployed in various section of the project. They usually work closely with the consulting firms to ensure all the requirements are followed closely and if variation happens, to get the approval from the relevant authorities. Small businesses can set up servicing companies to handle the repair and maintenance of the HVAC equipment. Usually a contract is signed between the customer and the servicing company to ensure the system continues to operate without much problem throughout the year. Many entrepreneurs also go direct to the household or domestic homes in providing installation and servicing of the air conditioning systems. The invention of mini split systems and window air conditioners have enabled many homes to affordable air conditioning and heating systems. Hence, air conditioning jobs such as coil cleaning, top up of gas and trouble shooting of the equipment are in demand these days.